Go to Utah for a great family vacation. 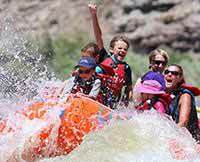 Our family of four rafted Utah's Green River Desolation Canyon in mid-July. I can't say enough about our three amazing guides. They went way beyond what I would have ever expected in order to make sure that everyone had a great trip. Such long days cooking, rowing, packing up, etc., and still somehow so much energy to be warm, friendly, fun, outgoing people who brought the whole group together. Des, Spencer and Josh were outstanding in every conceivable way. It was a perfect family trip and we will definitely be looking at a future trip with Western. This was our second one (bringing in a third generation) and definitely not the last.